These round little frogs grow no bigger than 10 cm long. You can tell males from females by the long sharp spine on their first finger. Western spotted frogs eat a range of bugs, spiders and worms. At breeding time, the males dig burrows a metre deep for the eggs and start to call out to the females. The females are attracted by the call of the males and lay between 250-700 eggs.The babies develop into the first stages of tadpoles whilst still in the egg and then wait until heavy rain floods the burrow to swim free. 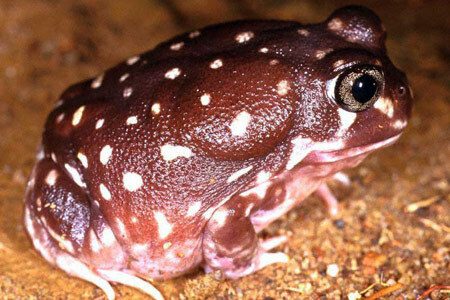 Western spotted frogs are quite common and can be found in a range of habitats throughout south-western Australia. Are there any other interesting facts that you would like to share about western spotted frogs?